Our batteries are tested as per MNRE norms @ C10 ratings . Introducing SoyoBat ™ Solar Batteries for solar products to perform under all weather conditions as well as in the most demanding operating environment. After realizing the importance of alternative energy sources like solar power, SoyoBat™ has now entering in producing batteries to power solar panels. Sun power batteries with their fast charging and low discharging rates, are designed to suit a wide range of solar panels. 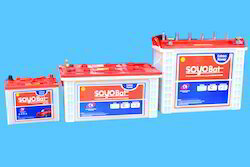 SoyoBat™ Sun Power 40AH has adapted a technology to make best use of eco-energy. Solar battery is the outcome of the research and it is the right solution as an alternative to conventional resources. SoyoBat™ has come out with the latest technology in power sector to help the power consumer to reduce his expenses and to get continuous power supply. Deep cycle design with very low maintenance. Strong rugged container with heat sealed cover handles for easy lifting. Fine grain structure for excellent corrosion resistance. Superior active material for excellent discharge performance. Supplied in factory charged condition.